Barron, T. H. K., and G. K. White. Heat Capacity and Thermal Expansion at Low Temperatures. New York: Kluwer Academic / Plenum Publishers, 1999. Ho, C. Y., M. W. Ackerman, K. Y. Wu, T. N. Havill, R. H. Bogaard, R. A. Matula, S. G. Oh, and H. M. James. "Electrical Resistivity of Ten Selected Binary Alloy Systems." Journal of Physical and Chemical Reference Data, volume 12, number 2, 1983, pp. 183–322. International Labour Organization (ILO). International Chemical Safety Card for Nickel. http://www.ilo.org/legacy/english/protection/safework/cis/products/icsc/dtasht/_icsc00/icsc0062.htm . Accessed on May 4, 2010. Jensen, J. E., R. B. Stewart, W. A Tuttle, H. Brechna, and A. G. Prodell, editors. Brookhaven National Laboratory Selected Cryogenic Data Notebook. BNL 10200-R, Vol. 1, Brookhaven National Laboratory, August 1980. Kaxiras, Efthimios. Atomic and Electronic Structure of Solids. Cambridge: Cambridge University Press, 2003. National Institute for Occupational Safety and Health (NIOSH). International Chemical Safety Card for Nickel. http://www.cdc.gov/niosh/ipcsneng/neng0062.html . Accessed on May 4, 2010. National Institute for Occupational Safety and Health (NIOSH). 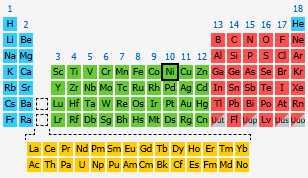 The Registry of Toxic Effects of Chemical Substances for Nickel. http://www.cdc.gov/niosh-rtecs/qr5aca30.html . Accessed on May 5, 2010. Sugar, Jack, and Charles Corliss. 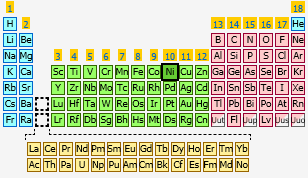 "Atomic Energy Levels of the Iron-Period Elements: Potassium through Nickel." Journal of Physical and Chemical Reference Data, volume 14, number 2, 1985, pp. 1–664.